The University of Florida hosted the first-ever on-campus SEC Student Pitch Competition this past Monday, November 13. The competition brought together the top student entrepreneurship teams from each SEC university to “pitch” their innovative product ideas to a panel of entrepreneur and investor judges comprised of established business leaders including SEC alumni. 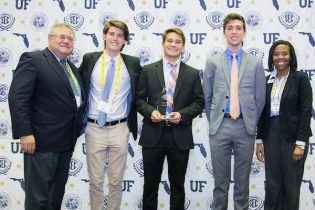 One Champion Team from each SEC university presented to the judges throughout the day and the University of Florida was proudly represented by Band.it which won the UF Big Idea Competition as a group of freshman engineering students in Spring 2017. Band.It came to UF from the Sarasota/Bradenton region and was mentored while still in high school by Jason Krywko of the UF Innovation Station as well as members of the Sarasota community such as the Gulf Coast Community Foundation partners. Band.it represented the Sarasota/Manatee region very well and came in second place in the competition, being bested only by a team of graduate students from the University of Arkansas.